This solidly constructed double-width vault interior unit contains 10 teller lockers and 2 coin cabinets, and is available in 16 different baked powder coat finishes. Units are of Integrated, uni-body, 18 gauge, double side wall construction. Units come standard with key locks but can also be furnished with combination locks, electronic locks, or any combination of the three. You can be confident in the quality of the construction of these units and they will give you years of service. The cabinets shown are in Champagne finish. Overall dimensions of the 17" deep unit: 32-1/2"W x 17"D x 41-1/2"H with interior locker compartment clearance of: 15-1/4"W x 15-3/4"D Overall dimensions of the 24" deep unit: 32-1/2"W x 24"D x 41-1/2"H with interior locker compartment clearance of: 15-1/4"W x 22-3/4"D The cabinets shown are in Velvet Beige finish. 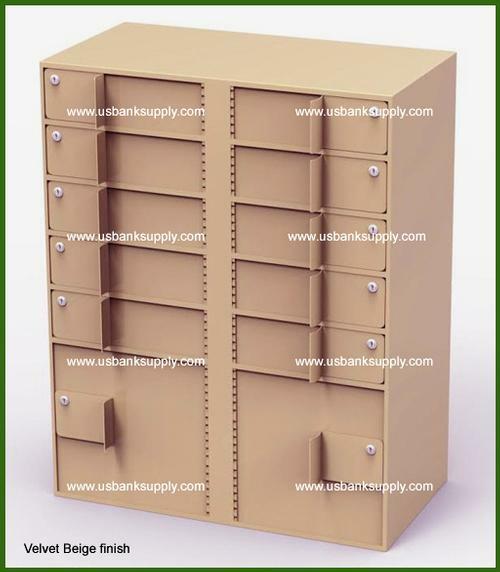 This solidly constructed double-width vault interior unit contains 10 teller lockers and 2 coin cabinets, and is available in 16 different baked powder coat finishes. Units are of Integrated, uni-body, 18 gauge, double side wall construction. Units come standard with key locks but can also be furnished with combination locks, electronic locks, or any combination of the three.